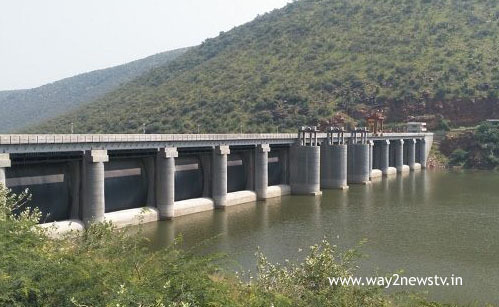 The dam was built with modern technology in the country for the first time. Vempalli Mandal in Kadapa district has been constructed with a total cost of twenty-six crore million rupees, "said Minister Devineni Uma Maheshwara Rao. On Thursday, the underground dam was constructed of sheet file technology in Papagni in Vempalli Mandal of Kadapa district. Umamaheswarar Rao, Somireddy, Adinarayana Reddy, MLC BTech Ravi, MP CM Ramesh Naidu and others were also examined. 6 crores 25 lakhs were spent for the construction of the project. Speaking on the occasion, Minister Devineni said that in the 175 constituencies of the state, the development of the same works as well as the development of the Pulivendula. TDP government is committed to farmers' well-being. We are going to develop Kadapa .. Jagan Mohan Reddy is trying to corrupt him. The Pulivendula region is overflowing with Krishnamma waters and the minister assured us that every aspect of the water will be seen. EP Opposition leader YS Jaganmohan Reddy was deeply impressed by Devin. Do you think anybody wanted to build a Surface Dam in the Papagni River in your own constituency? Jaganmohan Reddy said that the development of the Pulivendula region people is not aware of the promises. In the 40 years of political, life Rajasekhara Reddy questioned whether he wanted to give water to the Pulivenduvas. Before Chandrababu Naidu constituency, the Pulivendula was given water for 4 years. The happiness of the farmers here is that the happiness is going on. Jaganmohan Reddy said, "We are going to glee in the Pulivendula in 2019 general election.